The Best Women Empowerment blogs from thousands of top Women Empowerment blogs in our index using search and social metrics. Data will be refreshed once a week. 2.3 Girls Globe - Voices of women and girls around the world! Women Empowerment newsletter is a comprehensive summary of the day's most important blog posts and news articles from the best Women Empowerment websites on the web, and delivered to your email inbox each morning. To subscribe, simply provide us with your email address. About Blog Motivational Speaker on Female Empowerment. Follow for Information to help women create the satisfying and purposeful lives they want to benefit themselves, their families and their communities, provided by WomenConnect4Good. Facebook fans 2,050. Twitter followers 2,922. About Blog Women's Voices for Change is a news, commentary and opinion website that celebrates women's health, beauty, wisdom and vibrancy. We're here to remind the world how vital, versatile and powerful women over 40 are. Facebook fans 3,158. Twitter followers 3,063. 3. Girls Globe - Voices of women and girls around the world! About Blog We fight to create a sustainable world shaped by peace and solidarity, free from any discrimination, inequality and violence, enabling all girls and women to live up to their fullest potential. Facebook fans 6,013. Twitter followers 33,779. USA About Blog The mission of Brown Girl Magazine is to empower millennial women through features, interviews, stories, and discussion, we aim to create a community that helps young women see their strengths, develop self-confidence, and become well-rounded, independent leaders. Facebook fans 40,553. Twitter followers 11,066. Georgia, USA About Blog Daring Woman Media is about giving women a platform to share their stories of inspiration, heartache, love and experience. Here women can showcase their expertise and know that their words are giving someone else the hope, knowledge and motivation they need. It is about making a difference in the lives of as many women as we can. Facebook fans 165. Twitter followers 870. Jaipur About Blog Indian Women Blog is an online platform for the women of India. It expresses the life of Indian Women with heart touching unique stories. IWB delivers Global to Hyperlocal content to it’s audience. Facebook fans 378,931. Twitter followers 3,771. Los Angeles, CA About Blog A News Media Website Created To Inspire & Empower Millennial Women Daily With Positive Content. Follow for the global headquarters of female empowerment news media. Facebook fans 9,593. Twitter followers 7,556. About Blog A Girl, A Truck, A Surfboard and A Search For Something More. Melanie is a creature of challenge. Some challenges she chose. Others were chosen for her. All of them combined conspired to forge an indomitable will and ignite a spirit of adventure and discovery. She is currently out there in the world, where she spends her days surfing, writing and trying to learn what life has for her. About Blog Natalie is an Emmy Award-winning media entrepreneur, creator of soulseconds.com, and mentor to women entrepreneurs at shetakesontheworld.com. Facebook fans 60,240. Twitter followers 25,027. AZ About Blog You can not only overcome whatever life brings your way, you can become and even flourish. Life is Change, Growth is Optional. Facebook fans 3,377. Twitter followers 11,184. New Delhi, India About Blog Welcome to the Gender Matters, India blog, a project from Centre for Social Research in New Delhi, India. Our mission is to empower the women and girls of India, guarantee their fundamental rights, and increase understanding of social issues from a gender perspective. Facebook fans 47,356. Twitter followers 15,217. About Blog The W Standard Content & Copy Services. If you’re reading this, you’re the kind of reader and writer who seeks out bloggers who write from their mind’s eye like I do. You want to read work that shows you that it’s okay to write in a style that is unique to you. Facebook fans 155. Twitter followers 1,025. India About Blog Women of Worth (WOW) is a network of women across the city who believe that they can be agents of change. By empowering women and standing up for justice and equality in every facet of life and society, WOW seeks to help women to be the best they can be. Facebook fans 23. Twitter followers 420. About Blog My goal and motivation with this blog are to empower women live a balanced life in the 21st century. I believe that Faith, Family, Finance and Food are the four columns of a balanced life. Mobile, AL About Blog Thanks for visiting my site, Sylvia Browder’s Blog for Women Entrepreneurs. Our mission is to provide professional and personal resources while uplifting and empowering women entrepreneurs through collaboration, education, mentoring, spiritual and peer support, leadership and networking. Facebook fans n/a. Twitter followers 3,884. Denver, CO About Blog Women's Global Empowerment Fund is a microfinance non-profit working in post conflict northern Uganda, promoting economic and human security for women. The strategy of Women's Global Empowement Fund is to provide women with the framework necessary to create viable opportunities for themselves and their families. Facebook fans 1,943. Twitter followers 511. About Blog Spread body positivity while fulfilling your life's potential. Discover how the perfect balance of wellness, culture, and self-love can lead to a life with no limits. LIMIT.less is a place to feel body-positive, to speak your truths, and maybe to learn a thing or two along the way. Let's celebrate our beautiful lives together. About Blog Academy for Women Empowerment (AWE) launched in September 2013 with the hopes to teach young girls empowerment, leadership, decision-making, and well-being. That is when the idea of summer camps in El Salvador was born. Facebook fans 670. Twitter followers n/a. Mumbai, India About Blog Launched in 2016, as India's first tech accelerator for women entrepreneurs, we are an ecosystem for nurturing women entrepreneurship through accelerator, skill bootcamp, community building, conferences, industry/investor connect and access to funding. Facebook fans 479. Twitter followers 495. About Blog Inspiring girls to become tomorrow's leaders one video role model at a time. Profiling women in STEM and other non-traditional careers can make dreams reality. Facebook fans 57,122. Twitter followers 5,069. Chicago, Illinois About Blog A professional women's organization focused on the advancement of women. As an industry leader EWN provides opportunities for professional women to succeed and companies to develop their female leaders. Always focused on the belief that truly successful women nurture their health and well-being as well as their careers! Facebook fans 555. Twitter followers 35. About Blog EmpowerWomen is an open global platform that promotes collaboration, learning and innovation to advance women’s economic empowerment. It connects women and men in more than 190 economies with development partners from the private sector, civil society, academia, governments and international organizations. Facebook fans 202,611. Twitter followers 31,650. Sacramento, California About Blog Women's Empowerment educates and empowers homeless women with the tools & skills to get a job, create a healthy lifestyle, and regain a home for themselves and their children. Facebook fans 5,867. Twitter followers 3,297. About Blog I’m a Good Woman was founded by me, Jae Henderson. Among these pages you’ll find a place that sings the praises of women everywhere, presents positive images and messages of womanhood and allows the swapping of intelligent ideas. Facebook fans 840. Twitter followers n/a. About Blog A2Empowerment, Incorporated is a charity that provides educational scholarships and support to girls and women so that they may increase their knowledge and empower themselves to lead healthier, more productive lives. 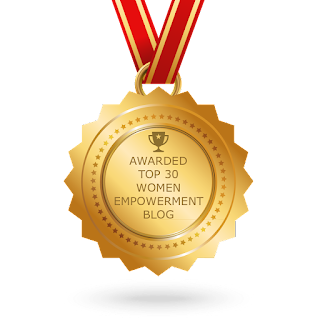 CONGRATULATIONS to every blogger that has made this Top Women Empowerment Blogs list! This is the most comprehensive list of best Women Empowerment blogs on the internet and I’m honoured to have you as part of this! I personally give you a high-five and want to thank you for your contribution to this world.